In 2014, our theme for IACP was “Evolve”, or, “Don't be a dinosaur”. We wanted law enforcement to step away from antiquated methods of policing and embrace modern technologies. Along with our (then current) lineup of camera and evidence management solutions, we announced our wireless activation technology for the first time. Check out our drone video of the conference — keep an eye out for our animatronic dinosaur suits. In 2015, we wanted IACP attendees to “Boldly Go” towards the future. We introduced our Body 2 technology, making the leap into the next generation of smart, evidence-capturing technologies, and took attendees on a spaceship journey to the future, complete with stormtroopers. And in 2016, our theme was “Is Today the Day?”. 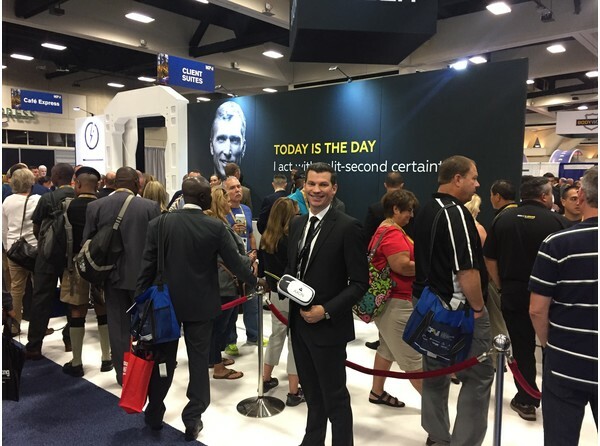 We told the story of the Axon network through a virtual reality video, showcased the newly-announced Flex 2 and talked about our goal to reduce police paperwork by 80% in the next 10 years by tackling RMS. So what can you look forward to this October? Another (still top secret) show-stopping experience where we'll be launching a new campaign and announcing new products and updates. Meet us at booth 2825, where you can get access to hands-on product demos, including of our newly released Signal Sidearm, plus find out how to give direct feedback during our Voice of Customer sessions, and get face time with sales reps. And, of course, we would be breaking from tradition if we didn't have a giveaway. We're looking forward to seeing you at the show. Want exclusive previews and the latest news from the show?